Carla currently supports LADSPA (including LRDF), DSSI, LV2, VST2/3 and AU plugin formats, plus SF2 and SFZ file support. It uses JACK as the default and preferred audio driver but also supports native drivers like ALSA, DirectSound or CoreAudio. Same as Multi-client, except that all JACK ports belong to a single master client. This is needed when a setup doesn't support multi-client JACK apps, such as LADISH. Every single plugin is exposed as a new JACK client. Audio and MIDI ports are registered as needed. 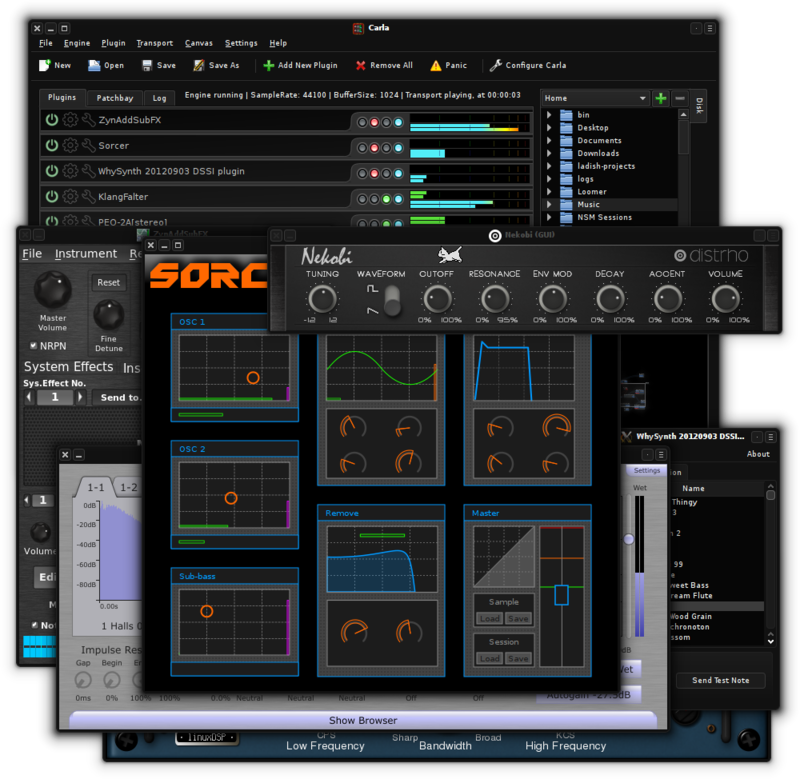 Plugins are processed in order, from top to bottom. Plugins with non-stereo audio channels are not supported, but a forced-stereo option is available for Mono ones. Modular patchbay mode, just like in JACK Multi-client and many other modular applications. Every plugin gets its own canvas group and ports allowing you to interconnect plugin audio and MIDI. The user can keep the custom theme but use system colors, or simply disable the custom theme altogether. The result may not be as nice though. The last tab "Log" simply prints debug info from time to time when an internal error occurs, in a way that doesn't disturb the user. This tab is not available in the Windows version. The first time you run Carla you'll most likely want to scan for plugins. You can configure your plugin folders in the settings if needed. When done, use "Add New Plugin" in the toolbar, then press the "Refresh" button. Because Carla is a somewhat complex application, a single page is not enough to cover it entirely. A few videos from falkTX, Carla's creator, showing off Carla's features and a few workflows. 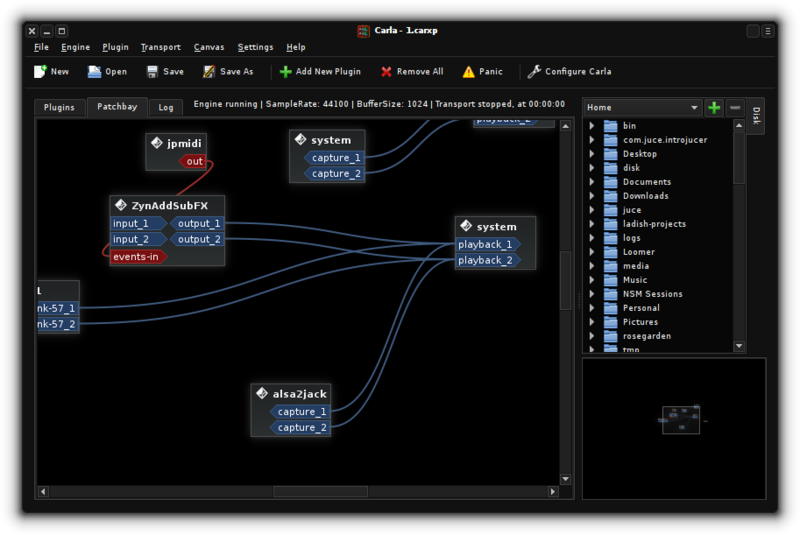 Carla is available in the KXStudio repositories, Fedora and ArchLinux (all with 'carla' package name). Pre-compiled binaries are available for Linux, macOS and Windows (version 2.0.0).